When you are traveling the busy capital of Hanoi in Vietnam, you will definitely pass by the main attraction of the beautiful mirror lake which is known as Ho Hoan Kiem Lake or also known as "Lake of the Returned Sword." Ho Hoan Kiem Lake is situated in the busy Hanoi downtown and also nearby to another top attraction of Hanoi Old Quarter (Hanoi-36 Old Streets) which offers variety of food, accommodation, clothing, accessories, shoes, household items etc. A famous legendary story leads us to believe that King Le Thai To was given a precious fairy Sword by the Golden Turtle God during the war with Minh aggressors. 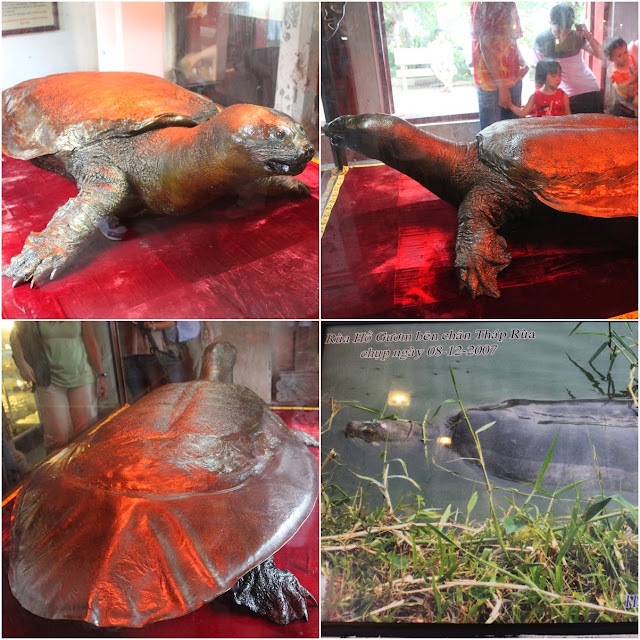 A large golden tortoise suddenly appeared and stole the sword with its mouth and submerged into the lake right after the King defeated the Chinese and reclaimed the land into independence. The King was upset with the missing sword but he believed that the God wanted the sword to be returned after the victory. Thus the King named the lake as Lake Ho Hoan Kiem. Majority of Vietnamese believe in Buddhism and there are some similar culture, religion and beliefs between Vietnamese and Chinese. There is a Chinese belief that patting the shelf of a tortoise or turtle would bring you luck. Chinese believe that a tortoise or a turtle has the power to improve one's health and increase your longevity. Hoan Kiem Lake and Ngoc Son Temple are highly recommended to visit while traveling the capital of Hanoi. They are the top list of attractions to visit for the first-time visitors in Hanoi. 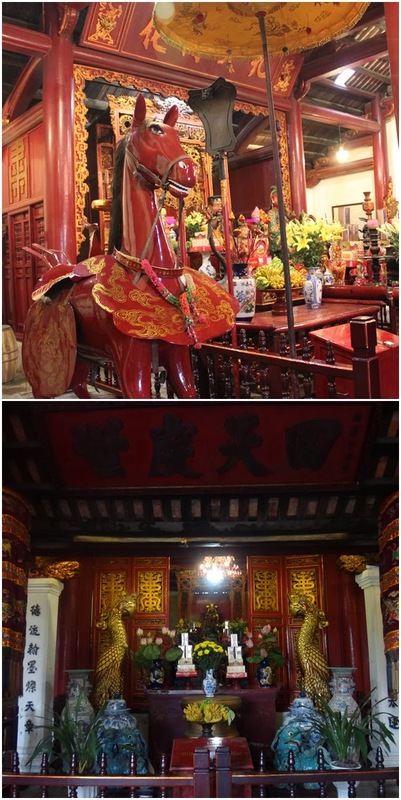 Ngoc Son Temple is situated on Jade Island where you need to cross the famous red Huc Bridge on Ho Hoan Kiem Lake. You need to purchase the entrance ticket at the booth before crossing the Huc Bridge. It is a small fee charges at US$1 (20,000 VND) per person and opens to the public from 8am to 5:30pm every day. In order to get to Ngoc Son Temple on Jade Island of Ho Hoan Kiem Lake, you need to pass through a few entrance gates such as, the main entrance of Three-Passage Gate (Tam Quan), Pen Tower (Thap But) and Ink-slab (Dai Nghien) before heading to Huc Bridge. 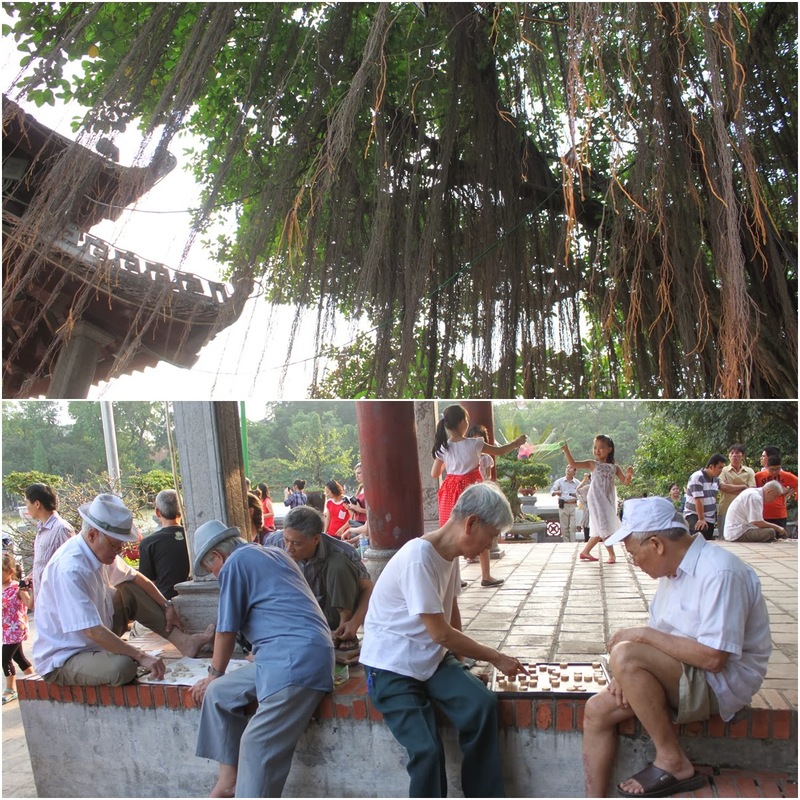 You'll notice many locals and elderly people visit Ngoc Son Temple in order to pay respect to deities and enjoy the cooling and windy weather while chatting or playing chess in the courtyard of the temple. The ink-slab ((Dai Nghien) the symbol of literature) shows that Ngoc Son temple was built and dedicated to Confucian, Taoist and literature in Hanoi, Vietnam.